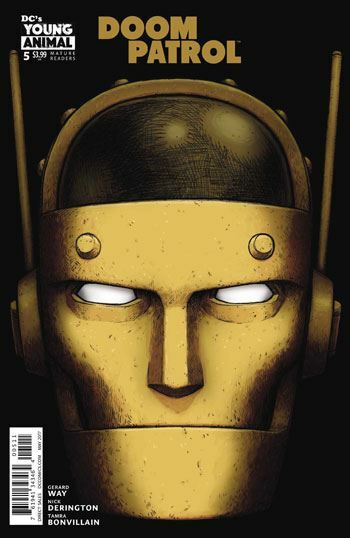 The Doom Patrol come together in issue 5 of their new series, as Cliff Steele and Negative Man leave the Negative realm and join up with Casey Brinke to save Danny the Street, now Danny the Ambulance. 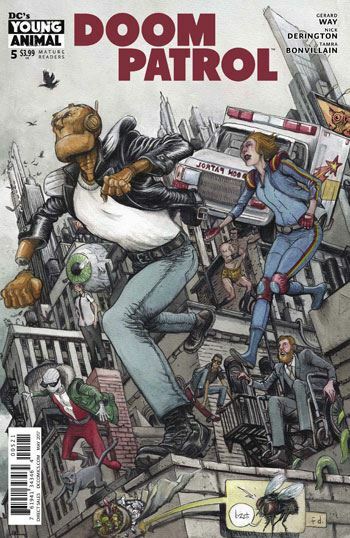 The comic continues to be a wonderful mix of the utterly bizarre, and fun super-hero action. It also has some really powerful and touching moments, not the easiest thing to pull off when dealing with a group of absurd characters. While the writing of this series is top of the line, the art is so critical to making it work. I was particularly pleased with the cover of this issue, the intense head of Cliff Steele. The scenes in Dannyland are lush in detail and madness, while the scenes in reality can be clinically cold, and the book moves between these effortlessly, thanks to Nick Derington. There are moments in this issue that are horrifying, and moments that make one laugh out loud. The issue provides satisfying action scenes, teasers for upcoming storylines, another weird cameo for the Chief, and a surprising conclusion. And if all that were not enough, a colouring page with Bane as the President of the US. Sad that this would be an improvement. And for me, well, I can tell you that I am guaranteed to give a glowing review to any story that includes Flex Mentallo radiating the words “Hero of the Beach.” So I guess I am stuck having to rave about this book. I don’t mind that at all.